Today marks the start of the labour day weekend. My kids were home today cos school was closed. So I have been mentally preparing myself for a long 4 day weekend. Don't get me wrong. I enjoy my kids most of the time. But sometimes I just need some space. Occasionally (note the guilty tone) I have resorted to using the iPad to entertain my older son while the younger son naps. That buys me a bit of time. He is happy and I am happy. To reduce the guilt factor, I try to be quite selective about the apps that I purchase. I prefer apps that require a certain amount of mental challenge or involves creativity. So today, I thought I would share a couple of our favourite apps with you. I love this. This is truly high on my list at the moment. This app allows a child to select a backdrop to a stage and characters for the puppet show and narrate their own script, record it and play it back. My favourite bit about Puppet Pals is that if you purchase the Director's Pass, you get to cut out your own characters from photos or use your own photos as the stage backdrop. The possibilities are endless and J really loves it. He created a little story which involved his classmates a few weeks ago. He was so amused! 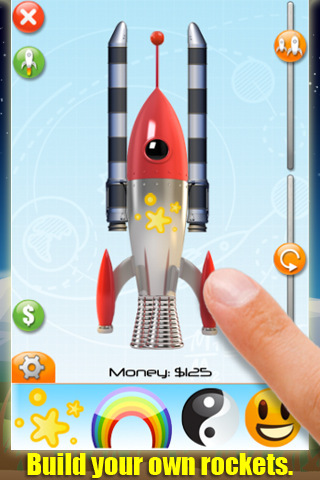 Rocket Math (as it is aptly named) is about rockets and math. You know how some apps pretend to be a game but are just truly trying to teach you something. I find that this app is educational yet packs a whole lot of fun in it. Kudos to the developers. The trick is that these items cost money and you can only earn money when you get some math problems right. You can see why this pleases me already, can't you! Then after building your own rocket, you have to launch it and complete some math problems to win a medal. What I love about this app is that there are easy, medium and hard levels which allows this app to be played for a long time unlike some apps which only teach you to count to 20. I found the multiplication questions pretty challenging at the hard level so it does pack a challenge which is nice. Plus I managed to make a pink rocket ship plastered with heart shaped stickers, purple fins and matching pink boosters! Geared is a simple game involving gears of different shapes that need to be connected to the yellow moving gear in order so as to move the blue gear (which is stationary). It isn't very complicated but how much fun your child derives from it will probably vary. I probably like playing with this game more than Jaeden does. I love watching the gears move though I think they could make it alot more interesting. For example, the last gear could lead to a tap that turns on a water sprinkler or a knob which makes a monkey puppet dance. Although, we haven't played this much and are only at level 11. There are 150 levels so maybe the monkey is at the end. :) Tell me if you get there, ok? Don't have paper or pen with you while you are out. This app is just that but much more. With Drawing Pad, you have coloured pencils, markers, crayons, stamps, paints with you at anytime and totally without the mess. Use Drawing Pad to play hangman, tic tac toe or scribble notes. Cut the rope may not be new to some of you but I will mention it here cos we do enjoy it. It was developed by the makers of Angry Birds and is a physics-based game that involves cutting ropes to feed candy to a little green monster. It is quite challenging at the higher levels but continues to be loads of fun. The graphics and music add to the fun plus the monster is pretty cute as he chomps on the candy. Hope you find some of these apps useful. For dads who might still be on the prowl for ideas for Mother's Day (which falls on 8 May 2011, next Sunday) consider helping your child to create an online mother's day card using Drawing Pad or a one-of-a-kind mother's day video using Puppet Pals. Post it on FB to thank your wife (the cyber equivalent of sending birthday flowers to the office). She will probably love you loads for it but make sure you choose some nice flattering photos of her for your kid to work with!